Mimics who fall victim to the designs of Macaulay probably know nothing about him: a maniac even by the uniformly bad standards among colonisers. He pushed a peculiar interpretation of human history based on a world of civilised and barbaric nations, with Britain representing the high point of civilisation. Karl Marx referred to him as a ‘systematic falsifier of history’; Liberal historian Lord Acton described him as “a raw English schoolboy, primed to the brim with Whig politics”. In Bengal the affected urban groups who considered the coloniser’s ways intrinsically superior to indigenous culture were referred to as the “Bhadra Lok” (Big People), a mocking reference to their ‘aspiration’ to become ‘big’ by mimicking the coloniser, rather than to any success gained through the process. Similar groups have always existed in Sri Lanka, though without a descriptive moniker. The recent attempt by three members of the so-called Friday Forum to provide a critique of the country’s official foreign policy stance, complete with a prescribed foreign policy framework moulded in their submissive mental cauldron, was a telling revelation of the mental subservience of Macaulay’s Children of Sri Lanka whose condition seems incurable. One of the signatories to the document is also a paid purveyor of American influence on Sri Lankan society and government, clearly ‘singing for his supper’. In a nutshell, the facile, amateurish analysis contained in the document, deceptively labelled a “balanced and principled” foreign policy, advocates a startling level of submissive compliance with the dictates of foreign empires, at the expense of national independence; The prescription is founded on erroneous assumptions and interpretations. The low quality of the attempt of the three ‘children’ – former Sri Lankan and UN diplomat Jayantha Dhanapala, life-long US embassy employee Tissa Jayatilleke, and a third member of the grouping that refers to themselves as the Friday Forum – is such that the involvement of a person with a career record such as that of Dhanapala’s in such an unprofessional enterprise beggars belief. The document from beginning to end is replete with inanities suggestive either of extreme stupidity, or mischief on behalf of the writers’ neocolonial masters. The matter-of-fact assertion that we currently live in a “globalised multi-polar” world is an example of the gross errors that underlie the approach of Dhanapala and Jayatilleke to world affairs: it appears that the writers have got drowned in the sea of linguistic obfuscation created by the empire! The idea of a “globalised multipolar world” is built up on the mutually exclusive geopolitical trends of the neocon ideal of “globalisation” and the preferred, natural global status of “multi-polarity” – a contradiction in terms as much as it is nonsense conceptually. The Globalisation project the American neocons launched in the early 1990s as part of the “new world order” was decidedly aimed at consolidating the unipolar world which they thought they had secured by orchestrating the break-up of the Soviet Union; globalisation has largely failed as a project, and a Russia-China alliance is rapidly emerging as a countervailing power to the neocon dominance of the world. The world is hardly “globalised” or multipolar! To say that we live in a globalised multipolar world is a significant misreading of the current status of global affairs, or an attempt to perpetuate self-serving US propaganda. This fundamental misunderstanding, or deliberate mischief making on their part, destroys the credibility of most other things Dhanapala and Jayatilleke have to say on how Sri Lanka needs to react to the world that they so appallingly mischaracterise. The groups’ attempt to castigate the professional foreign policy bureaucracy at the Department of Foreign Affairs for the so-called “unflattering international publicity Sri Lanka has received at the UNHRC” is nothing but another pathetic display of ignorance of the manner in which the US use forums such as the UNHRC to tarnish the image of countries led by non-US-compliant, independent leaders. The neocons’ ability to garner a vote of approval through bribery and coercion for such ventures is hardly “unflattering international publicity” for the countries concerned, except in the minds of Macaulay’s children perhaps. The attempt of the pair to portray the largely “imagined” negative publicity suffered by the country as a result of such neocon plots as indicative of “a significant failure of the government to exploit the opportunities of peace and reconciliation opened up by the end of the conflict” are fanciful. Such beliefs and resulting attempts to apportion blame are based on a fundamental misreading of the degree of awareness of such conspiracies among ordinary Sri Lankans. It is indeed incomprehensible that after decades of hanging around at the UN, Jayantha Dhanapala is not aware of the defining feature of US neocon foreign policy of digging in to other countries’ national affairs looking for ‘sticks’ to hit them with, as a means of diverting attention from human rights and other atrocities committed by the US the world over. Most students of international affairs are apprised of the lack of correlation between the success or failure of a developing country’s national achievements and neocon plotting in this area. Blaming the Sri Lankan bureaucrats for such unprincipled tactics of the neocons shows disturbing, as well as perplexing lack of depth of analysis by Dhanapala and Jayatilleke. The attempt by the Friday Forum authors to tell Sri Lankans that Sri Lanka’s foreign policy in the first three decades of post-Independence history was “balanced, pragmatic and sagacious”, and a policy that “enabled to exert an influence in the international arena disproportionate to her size” deserves scorn. Dhanapala and Jayatilleke will not be able to rewrite the simple historical fact that it was Sri Lanka’s shamefully pro-American and pro-British foreign policy during this period, reaching its nadir under J. R. Jayewardene that aggravated India to openly support Tamil militant groups. By attempting to describe such a massive foreign policy blunder of overlooking the sentiments of a significant neighbour as “balanced pragmatic and sagacious” the writers’ self-disparage their intelligence and integrity. The misreading and misrepresentation is further aggravated by the writers’ conclusion that the conflict with the LTTE caused a deterioration of foreign policy mechanisms into a defensive mode. This is utter nonsense. Every soldier, seaman and airman who fought the war will vouch that it was the complete surrender of the country to Norwegian, Israeli, American and INGO corruption and influences that dragged on the war until 2005 by mollycoddling Prabhakaran. No country with a sensible foreign policy would have allowed such total foreign control of its national affairs, even allowing for desperate financial, military and other circumstances. The description of the Non-Aligned Movement (NAM) as a movement that help maintain a “balanced relationship between the US and the USSR during the Cold War” again explains an apparent inability of Jayatilleke and Dhanapala to “read between the lines” of political dialogue on international affairs: there was little doubt that NAM was the brainchild of some of the most fierce independence leaders of Africa, Asia and Latin America who took action to further distance their countries from the influences of the colonisers. To read such an initiative as aimed at “balance” is imbecilic, to say the least. In their attempt to force Sri Lanka to toe the line of America, Dhanapala and Jayatilleke then adopts the unbridled neocon vocabulary to speak of “transgressions” of the Latimer House rules, Rule of law, international law and treaties, international humanitarian law and R2P, with a quote from Paul Sieghart, apparently one of their heroes. 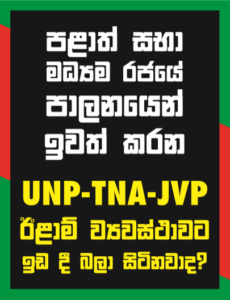 No amount of propaganda work from Tissa Jayatilleke, or addition of UN-type credibility from Jayantha Dhanapala will alleviate the degree of healthy scepticism of the developing world of such dishonest terminology, founded on murderous campaigns in Iraq, Afghanistan, Syria and Libya. In a sardonic refutation of their neocon masters own behaviour, Dhanapala and Jayatilleke advocates policy formulation and decision making preceded by “civil society consultation”. Obviously, they mean the “society” of elite foreign policy commentators such as themselves and the NGO mafia who would love to formulate the country’s foreign policy. At the end of the day, Dhanapala’s and Jayatilleke’s substandard contribution to Sri Lankan foreign policy formulation will be tomorrow’s ‘fish and chips’ wrap. However, it is important that Sri Lankans with an interest in the country chartering a new, independent foreign policy see such incompetent efforts to cling to a colonial past that they are unable to shake-off as risks the country needs to ward off. The career history of the two leading authors of the document representing the amorphous Friday Forum (that also includes J. C. Weliamuna) points to some telling facts about their true intentions. Jayantha Dhanapala, as a former UN diplomat, has knowingly or unknowingly contributed to the neocon Iraqi conspiracy by laying down the UN agenda for arresting the “proliferation” of “weapons of mass destruction” since he was hand-picked in 1997 by the neocon appointed UN Secretary-General Kofi Annan to re-establish a Department of Disarmament. The work was actually in preparation for the neocon atrocity on Iraq under the guise of implementing the UN ‘reforms’ dictated by the raging neocon Richard Holbrook. Dhanapala is also a faithful servant of the neocons through projects such as The Bulletin of the Atomic Scientists, founded interestingly by former Manhattan Project physicists, the inventors of the only nuclear attack in history, to advocate for the international control of nuclear weapons! Tissa Jayatilleke has been the Executive Director of the Sri Lanka-US Fulbright Commission, for more than twenty years, designed to increase “mutual understanding” between the people of the United States and the people of Sri Lanka. Most of us may not be certain as to the degree of understanding of Sri Lanka among Americans, but most Sri Lankans surely have a good understanding of the neocon controlled America and its intentions. This understanding helps us discard policy prescriptions emanating from the general direction of Fulbright Commission after careful study, though it is a pity that Jayantha Dhanapala’s reputation also goes to the bin with that.